David Andrew Stieb is a former Major League Baseball right-handed starting pitcher for the Toronto Blue Jays. A seven-time All-Star, he also won The Sporting News' Pitcher of the Year Award in 1982. Stieb amassed 140 wins in the 1980s, the second-highest total by a pitcher in that decade, behind only Jack Morris. 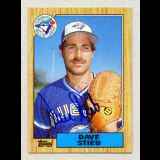 Dave Stieb was inducted into the Ontario Sports Hall of Fame in 1995.